We are members of a number of multidiscerplinary consortia in this area. 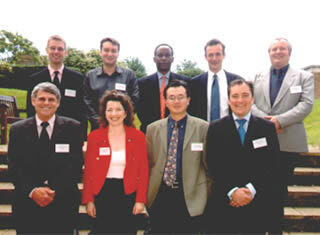 Renewable Composites Consortium. Led by Dr. Kerry Kirwan of the Warwick Manufacturing Group and with partners Prof. D. Pink, and Dr. G. Barker of WHRI (Plant Breeding, Biodiversity, Genetics and Genomics). Adaptive processing of natural feedstocks consortium. Led by Dr. A. Lapkin (Bath, Engineering) with Prof. I. Thompson (Oxford, Microbiology), Dr. G. Barker (WHRI, genetics), Dr. A. (Newcastle), Dr. Y. Ding (Leeds). See our consortiums report in plastics and rubber weekly Sep 2006. We are currently exploring the use of vegetable oils (e.g. rapseseed, linseed) and other plant renewable origin oils (e.g. Euphorbia) in the preparation of polyurethanes. We have also prepared vegetable oil composites using hemp and jute. In collaboration with Sustainable Composites Ltd. , the Eden Project, Warwick HRI and WMG a number of demonstration pieces have been fabricated. We are currently working on a racing car with WMG. Very recently we have been studying the diversity in oil profiles available within different crop types and using this knowledge determining how the fatty acid composition may affect the properties of the compounds produced from the oil. This has proved very successful and has allow us to develop a novel technique for mimicking the natural oils and hence allow testing of profiles for novel crops prior to expensive breeding programmes. We have gone on to utilise this knowledge to produce a range of polyurethanes with differing properties. We are going on to identify the oil components which convey the different properties in order to be able to predict the optimal composition of the fatty acids required for a given application. Characterisation using MALDI and Chemical Manipulation of Euphorbia Oil Towards Polymer Feedstocks, A J Clark, in “The Development of Euphorbia Lagascae within the European Community (FAIR CT98/4460)”, Eds D. Turley, M. Fremont and S. Cook, ADAS, 2000, 52-57. New Feedstocks for Polyurethane Synthesis. J. A. Sherringham, A. J. Clark, B. R. T. Keene Lipid Technology. 2000, 129-130. Mechanical Properties of Hemp Fibre Reinforced Euphorbia Composites. A. J. Clark, N. J. Tucker, L. Mwaikambo. MacoMol. Mat. Engin. 2007, 292, 993-1000. Synthetic Mimicking of Plant Oils and Comparison with Naturally Grown Products in Polyurethane Synthesis, S. R. Coles, G. Barker, A. J. Clark, K. Kirwan, D. Jacobs, K. Makenji, D. Pink, Macromol. Biosci. 2008, 8, 526. Degradation studies of polyurethanes based on vegetable oils. Part 1.photodegradation, A. Z. Mohd Rus, T. J. Kemp, A. J. Clark, , Progress in Reaction Kinetics and Mechanism, 2008, 33, 363. Degradation studies of polyurethanes based on vegetable oils. Part 2. Thermal degradation and materials properties, A. Z. Mohd Rus, T. J. Kemp, A. J. Clark, Progress in Reaction Kinetics and Mechanism, 2009, 34, 1-41. 1. Patent application filed, July 06. Prototyping process for oil-based products - Guy Barker, Andrew Clark, Stuart Coles, Kerry Kirwan, David Pink, Nick Tucker. 3. Poster presented at 5th European Motor BioFuels forum (11th - 13th Sept 06, Newcastle). Production of tailored oils for resin manufacture utilising the biodiversity within plant species - Guy Barker, Andrew Clark, Stuart Coles, Kerry Kirwan, David Pink (no abstract).